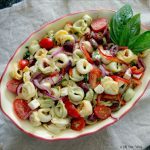 Rainbow colored tortellini mixed with Mediterranean style vegetables to give this pasta salad a unique look and taste. 12 oz. package cheese tortellini I used the rainbow colored cooked according to directions. Do not overcook. Cook the tortellini in salted boiling water according to package directions. Be sure not to overcook. Place the tortellini in large bowl and and mix with the 1 1/2 Tablespoons extra-virgin olive oil. Cool. Mix the halved grape tomatoes, sliced olives, diced onion, pepper slivers, sun-dried tomatoes, feta cheese, lemon zest with the pasta. Whisk the balsamic vinegar and garlic olive oil together then pour over the salad. Mix well. Add the basil chiffonade and gently mix together. Taste and make adjustments if needed.